After yesterday’s meeting with Ukrainian President Poroshenko, Italian PM Renzi met today with Vladimir Putin, President of Russia. On the agenda there were last international developments from Ukraine to Libya and their bilateral economic relations. Matteo Renzi confirmed the fruitful economic cooperations between the two countries in a wide range of sectors, announcing also the opening of new Italian production facility in Russia. He stated that Italian priority is to fight extremism and terrorism in the framework of the UN Security Council finding a solution in Middle East and North Africa. Concerning Ukraine, he stated that important steps have been undertaken and Italy is ready to assist the peace process between Russia and Ukraine. (Russia Today live press conference). 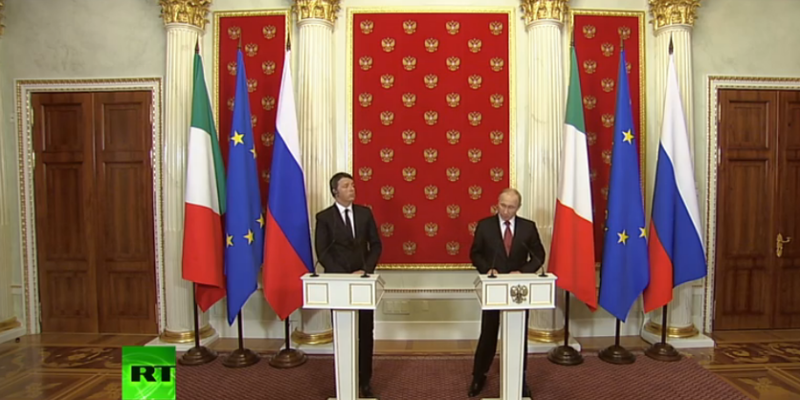 According to Corriere della Sera, Renzi supported the postponement of further EU sanctions to Russia.